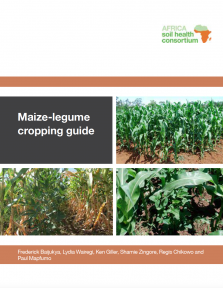 The maize-legume system cropping guide is a practical 88 manual focusing on good agricultural practices for maize-legume production that promote integrated soil fertility management. Produced by ASHC. High and low resolution versions are available for downloading -this cropping guide is available in English only. A black & white, easy to print and photocopy, version will be available soon - the text is the same but the format is A4 and any images that rely on colour have been replaced. The groundnut system cropping guide is a practical 64 manual focusing on good agricultural practices for groundnut production that promote integrated soil fertility management. Produced by ASHC. The cassava system cropping guide is a practical 64 manual focusing on good agricultural practices for cassava production that promote integrated soil fertility management. Produced by ASHC. A black & white, easy to print and photocopy, version is available - the text is the same but the format is A4 and any images that rely on colour have been replaced.